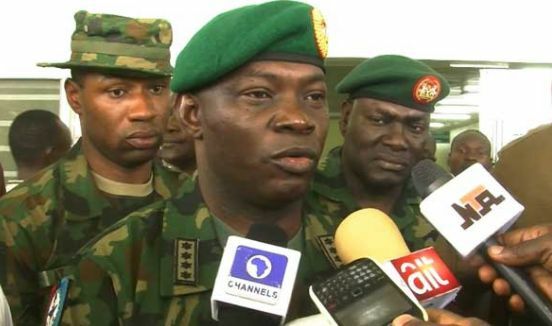 9 days after the Niger Delta Avengers (NDA) issued threats to blow up oil assets in the Niger Delta region, the Chief of Defence Staff (CDS), Gabriel Olonisakin, has vowed that the Nigerian Armed Forces will strictly prosecute groups associated with violent agitations in the country. The CDS made the vow during the induction of 20 sophisticated gunboats acquired by the Nigerian Navy on Saturday at the Warri Naval Base, Warri, Delta State. Olonisakin bemoaned the level of threats and violence in the Niger Delta region which has attracted the massive presence of the military among civilian populace. “Today, our nation is challenged by multifaceted threats from both continental and maritime fronts with a great manifestations. In the seaward aspect, the nation’s maritime security drivers have been marked with increasing complexities in recent years covering both traditional and nontraditional threats, continuing and increasing challenges across the regional maritime security environment. Coming landward, there have been continued militarization of the Niger Delta and the proliferation of weapons among non-state groups. According to him, “within the section of this great review, I’m constrained to recall with regrets the continued consideration of violence, threats of violence (sic) of our differences. "The recent purported declaration with intent to resume hostilities by the Niger Delta Avengers rather cast an unfortunate blow on the wellbeing of the region and serves a sad commentary on the collective security of the environment.